What's the big deal? It's only a couple hundred years off. Typefaces, or fonts, are Serious Business. Although they may be taken for granted by most people, typographers and graphic designers treat them with reverence. Because of this split in sentiment, there are instances where works take place in a different time period, but a font that was not invented is used because, to some, they all look the same anyway. This leads to designers becoming highly annoyed, although others who aren't attuned to the differences in similar typefaces don't particularly notice. Or care. Even medieval, pre-print manuscripts with modern letters will probably go unnoticed by most, because we are so used to seeing neat, standardized lettering in books. Under the right circumstances, this can count as an Acceptable Break from Reality if text that the audience needs to read is rendered more legible, with the calligraphy "modernized" just as the spelling is. Keep in mind, however, that some movie-makers purposefully use anachronistic type; a modern incarnation of an old-style typeface can evoke a particular time-period while still engaging the audience. Also, an evocative type treatment can avoid a movie looking dated rather than a tasteful period piece. For more in-depth insight on this, read the article by Mark Simonson here. See also Fonts, and for fun, Kinetic Type. Some works feature the usage of lowercasenote Techically minuscule, since the terms upper case and lower case refer specifically to typesetting letterforms—or, worse, upper- and lower-case forms used together with their modern meaning—when they did not exist yet. note Charlemagne created Carolingian minuscules circa 771 AD. Lowercase letters came after around the 15th century. A period piece that takes place before these times and uses lowercase letters unwittingly triggers this trope. Commercial vehicles are especially problematic since old-style hand painted signwriting was permanent, most cars used in movies are rented, and vinyl lettering instead is pretty obvious. Comics from The Golden Age of Comic Books that are featured in works may use Comic Sans as text in word balloons although it wasn't invented until 1994. These books typically used hand-lettering.note And still typically do, because Comic Sans is hideous. There are "hand-lettering" fonts that are much better, though. The film Chocolat features a poster whose words are typed in ITC Benguiat, a typeface invented in 1978. Unfortunately, the movie takes place in the 1950s, which means ITC Benguiat wasn't invented yet. The movie Dead Men Don't Wear Plaid is a film-noir throwback taking place in the 1920s. A brochure shown in the film is written in Blippo, which wasn't invented till the 1970s. In the film Tucker: The Man and His Dream type is used quite well and true. One hiccup is the Machine and Tool sign, featuring Helvetica, which wouldn't have been used in such a manner in the 1940s. That, and Helvetica itself was created in 1957. In Forrest Gump the letter from Apple Computer is dated 21 September 1975. The font used on the logo, Apple Garamond, wasn't used by Apple until the launch of the Macintosh in 1984. The font was only designed in 1977. For that matter, the rainbow Apple logo was first used in May 1976. The documentary Martin Luther King and the March on Washington features a banner in Arial. Arial, the Helvetica-replica, wasn't invented until the 1980s. Titanic (1997) features Helvetica (invented 45 years later) on some of the gauges on the ship. Titanic takes place in 1912. The current Helvetica font does resemble some proto-Helvetica fonts in existence in 1912, so it's not too egregious an error. In The Shawshank Redemption, the rubber stamp used by the parole hearings people in 1947 prints in the Helvetica font, a decade too soon. In Pearl Harbor, the ticker-tape coded messages Capt. Thurman reads is printed out in Helvetica. In Valkyrie, on the banner with the inscription "Führer befiehl, wir folgen dir", the font used is a Fraktur type. This is extremely improbable, given that Hitler had banned all Fraktur types in 1941 while openly stating that they were of Jewish origin. note The ban applied only to government publications; private printers, while strongly discouraged from using Fraktur types after 1941, were not forbidden from using them. Many newspapers kept using Fraktur types for headlines and their names, and Mein Kampf, which was published by a private company, kept its title in Fraktur type probably because it was cheaper to not redesign the cover. The Good Shepherd has a scene where, when Matt Damon steals a briefcase and reads a memo listing the Nazi party members - the title of the memo is set in Arial, which wasn't available as a font until 1982. Furthermore, the memo looks laser copied rather than typed. The fact that this is a closeup view makes this a rather obvious mistake. In Bram Stoker's Dracula, we see a ticker tape typing out the message sent to Van Helsing from Dr. Seward. The type appears to be OCR (optical character reader) font, which was not created until 1968. In Public Enemies, as John Dillinger and his associates leave the red train car, the car number seen on the outside of the car is in the Helvetica font, which was not created until 1957. The Queen shows the numberplate on the Range Rover as having the new style 'Charles Wright' font, which was introduced in September 2001. A League of Their Own is set in 1943. The "Catch a Foul—Get a Kiss" banner is printed in the font "Banco", which was created in 1951. Critically-aclaimed film The Artist features an array of anachronistic and stylistically questionable type treatments. Some of these are deliberate to evoke the silent-film era rather than copy it. The Israeli film I Once Was, set in Israel in The '60s, features a scene taking place in a film theatre with modern subtitles. In The Barber of Siberia, Douglas McCracken's sign is in the Times font. The film is set in 1885, almost 50 years before that font was created. According to the title song, Thoroughly Modern Millie takes place in 1922. But at least one of the posters for it is set in Broadway... which wasn't designed until 1929. The Princess and the Frog: A newspaper dated 1926 is printed in Times New Roman, which would not be designed until six years later. In Mad Men, the sign on the original Sterling Cooper building is Gill Sans, which was not in popular use in the United States until the 1970s (of course, it's not impossible, since Gill Sans was released in 1928 and was popular in its native Britain from the 1930s onward). There are other future fonts, mainly in shots of print ads: Fenice (1980), Balmoral (1978), ITC Kabel (1975), Bookman Old Style (1989), Zapfino (1998), and Gotham (2002) (although this one is tricky, since Gotham intentionally mimics older the styles of public-building lettering in New York from the 1930s to the 1960s). Of course, there were similar fonts—sometimes quite similar—to all of these in existence in the 1960s; presumably, this was a measure to save time and money. Notably, the first episode of the show features an advertisement in the aforementioned Zapfino. 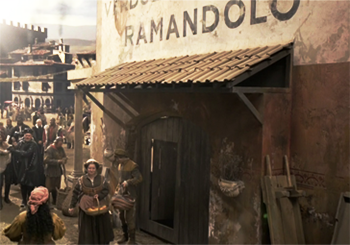 In the series DaVinci's Demons, the typeface Gotham (2002) is seen on a Renaissance building. If the font mimicked historical styles, we could maybe give it a pass, but sans-serif styles didn't exist until the late 18th century. Gotham was based on popular types of the 1930s. In Call of Duty: Black Ops, the typeface on the intel collectible does not appear to be written on a typewriter or a basic word processor; the font is much more advanced than its time. This is but one tick mark in a long, long list of glaring anachronisms in the game. The BioShock games set in Rapture use Century Gothic extensively, including in the logos. True, it was based on the typeface Twentieth Century, which was around by the 1940s, but there are modern implementations of that, so why not just use it? (Or Futura, which is a more accurate approximation and was also around by then.) Maybe some enterprising designer who moved to Rapture happened to invent a font that looked just like it? Some of the first cracks in the Bush Air National Guard documents story came from font enthusiasts who noticed that the supposedly typewritten documents used a proportionally spaced font and superscripting, things that weren't possible on a typewriter. During a political scandal in Pakistan, A selection of documents revolving around Prime Minister Nawaz Sharif purported to have been written in 2006 were suspected as being forgeries because the font they were written in, Calibri, didn't exist in Microsoft Word until the following year. "If you make a period piece, you shouldn't use a font from the Futura! I mean, what the Helvetica were they thinking? Arial typographer would never allow this to happen! I ought to slug those Wingdings for the Myriad of ways they have failed."